At Salsa Express, we are proud to be able to offer the entire line of more than 25 Mrs. Renfro's salsas, bbq sauces quesos and more. 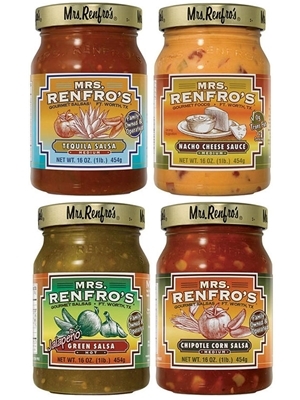 With this 4 jar gift set, we are able to let you decide which Mrs. Renfro's items are included! Simply select which four items you want included, add your personalized greeting (optional) and click 'Add to Cart'. They are shipped out in a heavy duty white shipper box. Choose from the items listed for the forth salsa to be included in the gift box.